The moment I stepped into the buzzing Nairobi evening and saw the familiar face of Paul Kamanga, my heart beat dropped and settled into Kenya mode. Its been 2.5 years since my last trip to Kenya and I have missed the people and the country every day. With the luggage in the back and me in the front, Paul and I started the last leg of my journey; to Naivasha and Eburru, where I would spend my Easter break. In Naivasha I was greeted by Steve, Mary and Lucas and in no time I had a cup of chai in my hands. I have been given several names in Kenya, but the one that sticks the most is Chai Doctor. I’d like to tell you a little about my friend Paul Kamanga; on my first trip to Eburru, he took me hiking to the top of Eburru mountain. He also helped translate for me when I had patients who did not speak English. He is the person who usually picks teams up and drops them off at the airport, as well as driving them around Eburru. Paul and his family has become my family; on my first visit he shared with me that he never went to high school because he had to work in order to help his single mother feed a family of six. His mother passed away when he was 19 and he was left to raise his younger siblings. He now has a young family of his own and it is often a struggle to feed and clothe them all. 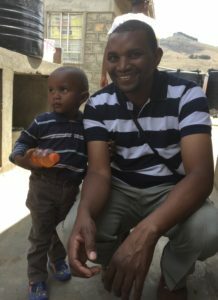 Being the driver for teams visiting Camp Brethren has provided a vital income for him and his family. A couple of years ago he was given a financial gift which enabled him and his wife to start a small sugar cane juicing business in their home town and this has been going really well. On my way back to Nairobi on my last day I was so happy to be able to stop by and taste their amazingly delicious juice. It is, and always should be, the goal in any help organization, to strive to make people self sufficient. The old saying; give a man a fish and he is fed for a day; teach him to fish and he is fed for life is still just as true today. Paul and his family is only one example of that connected to Camp Brethren. 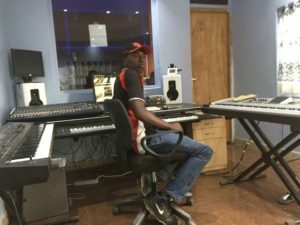 Allan, an incredibly talented young man, who now has a music recording studio at the school and is getting recording requests from outside the community. 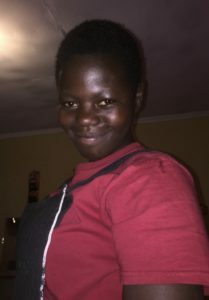 Lydia, a young woman who finished high school in her twenties, who went on to get a beautician degree and is now running a beauty salon at the school and teaching others in her trade. Her best student is a 14 year old mute girl. Mary discovered this girl in a neighboring village a little over a year ago. The girl and her mother and two siblings were living in a tiny one room mud hut in horrible condition. Pauline, the girl, had never been to school and showed obvious signs of neglect. She is now at camp Brethren and is a happy and healthy girl. When I think about the work Mary and Steve started so many years ago and I see where it has become today,I am in awe over their self sacrifice, their strong faith in God and their will to never give up or give in. It is so easy for us to sit back and do nothing, to think what can I do, I’m only one in this myriad of people on this earth. What difference can I make, why even bother.I look at the people I have met and who have captured my heart forever and I know that what I can do matters. It matters to them, it matters to me, but most of all, it matters to God.My hope and pray is that you will feel the same way and give of your time, your talents, your possessions and your love. Building houses and hope in Eburru. By Tim and Jen Winter. David's Hope is a non-profit organization that partners with a local Kenyan organization to build long-term, sustainable solutions that address the needs of the community in Eburru, Kenya.